Researchers from Chemnitz University of Technology in Germany have developed a range of bio-based fiber-plastic-compounds that could be produced on a large scale as an alternative to glass and carbon fiber reinforced plastics. 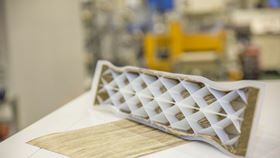 ‘We replace the glass or carbon fiber with natural fibers such as flax,’ said Ahmed-Amine Ouali, research associate at the Institute of Lightweight Structures. ‘Our plastic matrix is a biopolymer of renewable resources. Thus, the carbon footprint in the product’s life cycle is significantly better.’ The use of continuous filaments renders the compound extremely stiff and highly rigid in the direction of the fibers, the researchers say. The Omega-calender consists of several cylinders through which the flax-fiber- plastic-films can theoretically be led continuously, heated up, and pressed together. After the impregnation process and the cooling of the thermoplastic prepregs the fiber-matrix-semi-finished product is complete. It is wound up on a role and can be further processed in various ways, by cutting to size with numerous layers pressed as a stack a rigid plate emerges. ‘We can also form the semi-finished product once more and combine it with injection molded products,’ said Ouali. The production procedure is currently intermittent, with a stop after the continuous production of the prepreg-semi-finished product. Depending on the need the production then continues in numerous different plants. Yet, with regard to large-scale production, the manufacturing path can be supplemented or combined accordingly, the researchers say. ‘We will further experiment with various fiber structures as knitted or non-crimp fabrics, or in other forms and with different matrix combinations for example films or spun-bonded fabric,’ said Ouali. This story is reprinted from material from Chemnitz University, with editorial changes made by Materials Today. The views expressed in this article do not necessarily represent those of Elsevier. Finland-based Arctic Biomaterials has won a bio-based material of the year innovation award.